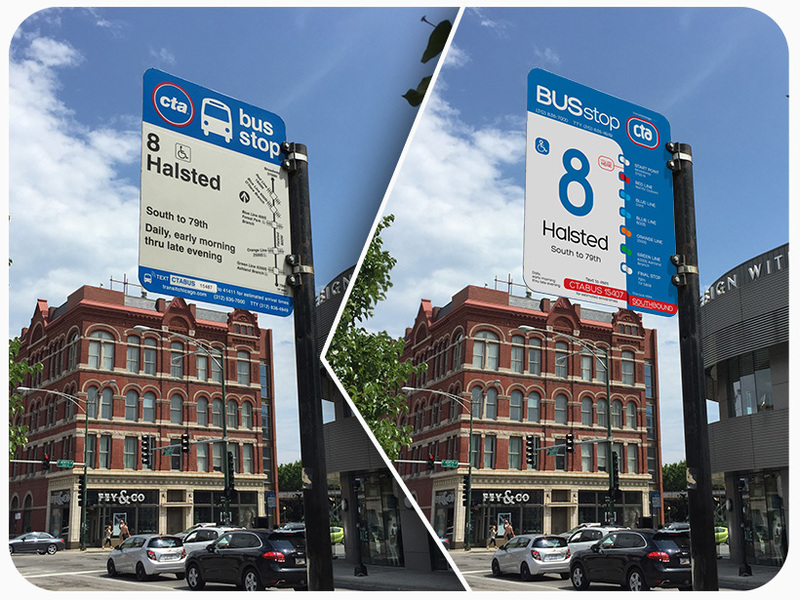 How would an evolved CTA bus stop sign look? One of our greatest professional pleasures is to imagine how things could be evolved. As brand strategists, we take this type of exercise very seriously especially when thinking about things that we take for granted. For example, the CTA bus stop sign. How can we make it better? How can we improve that just for the sake of a fake imagined project. If CTA would hire us to design all the signage what would we tell them? What would we show them? The “Imagined Evolutions” blog post category is meant to provide you with a different perspective. As all things in the branding realm, there is a HUGE amount of subjectivity invested in these type of creative bursts. So, very often our perception of better is your perception of “worse”. Don’t worry! Tell us your thoughts and bring arguments. We are constantly learning and I am sure that some of your inputs could make our next “Imagined Evolution” a better one. At the same time, please take it easy, we’re just playing around and trying to stretch some creative muscles. Don’t be offended and have fun. When was the last time you made an effort to change something around you and make it better? Your version of “better”? Those that know us, know we love creating new visual identities. When we analyzed the CTA logo we thought that is not too bad. It is a bit “old” but to be fair we’ve seen much worse. 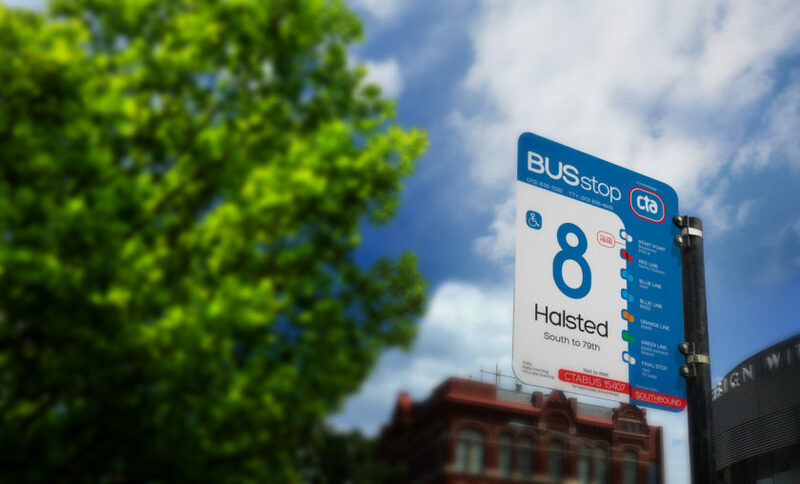 Still, what the heck, it is our “dreaming” session so we created something that would help us more in the final goal: a new and improved Bus Stop sign for our beloved Chicago. What we did not like in the current CTA logo was the fact that the circle was creating too much negative space around the logotype. It is well balanced but it seems to have too much “empty” space. The Helvetica font used to “write” the “cta” is a classic move. We wished more time or energy was invested in giving a purpose to the letters. We always say in our agency, that the logotype elements need to have a vibe of togetherness, something that makes them belong to each other. We literally hated the fact that the “c” wast not kissing and hugging the “t” and we may have nightmares about the “foot” of the “t” just letting the “a” be there. How we approached our version? we almost always start with a simple form – in this case the circle. we built the “a” around that circle, and we used the same base to mirror the element into a symmetric “c”. then we gave the top part of these two letters a visual reason to “t” that seems more like a sibling than a stranger (the same DNA). when finishing the “t” we took care to end the “foot” with a curve, even if it’s slightly messing a bit with the visual symmetry. why? we had to move apart from the “cross” symbolism, associated also with “death”, grave, etc. we created then the “support” – the bad that the letter’s (the new logotype) would now lie on; in assembling it we tried again to give a purpose and a reason why = the “round cornered” rectangle is complementing the roundness of “c” and “a”. we kept the colors because we felt like they should stay the same for the sake of familiarity. don’t worry we’ve noticed the weird edging of the sides; it is not a “perfect” round cornered rectangle and we didn’t want that – for us the “edgy” perimeter has a touch of personality AND we did not want the full “ventra card” look. It’s incredible how much joy we get from these types of fake projects. Imagine: no brief, no client to tell us what he/she would like, no opinionated crowd to please. Just us, a problem and an emerging solution. Summer perfection! for the record, we are CTA commuters, so we ARE the target, we are the “consumer” – it always annoys us that the CTA bus stop sign bus number can’t be seen from a distance; we know we are on Halsted, but what if there is a tourist that just landed on “planet” Chicago? The first thing we did: we made the bus number LARGER. we aligned, structured, increased readability… design stuff. This is a creative exercise. We were not hired by CTA or its representatives. All copyright rights belong to Brandacadabra. Please ask before republishing or just make sure you give us credit. If at some point the CTA or Chicago hall wants this “Imagined Evolution” they have to give us credit and pay us $8 (eight dollars) for these deliverables. Makes me want to sell my car, and join the public transportation movement! I don’t think you’ll do that. What about those long phone calls while driving your car? For you, Reed, it wouldn’t be practical. How much for the car, by the way? My absolute least favorite thing about the bus stop signs are the ‘diagrams’ – riding the bus for 15 years and I never understood them (maybe I’ll look that up right now?). On another note, the reasoning behind the logo direction is maybe my favorite part of this, but I also think the logo would be the most obvious sticking point. Thank you, Marcin, for your thoughts! I think the diagrams have a very specific technical meaning that makes sense to a road traffic engineer. Who knows, perhaps everybody else knows their meaning. While I like the font size, I’m not a fan of the reimagined logo (doesn’t convey movement) or the font itself. The “you are here” is a nice touch and the color-coded ‘L’ line stops are cool, but the map needs some work. In fact, on a route like 151 Sheridan or 157 Streeterville-Taylor this map style simply would not work at all. 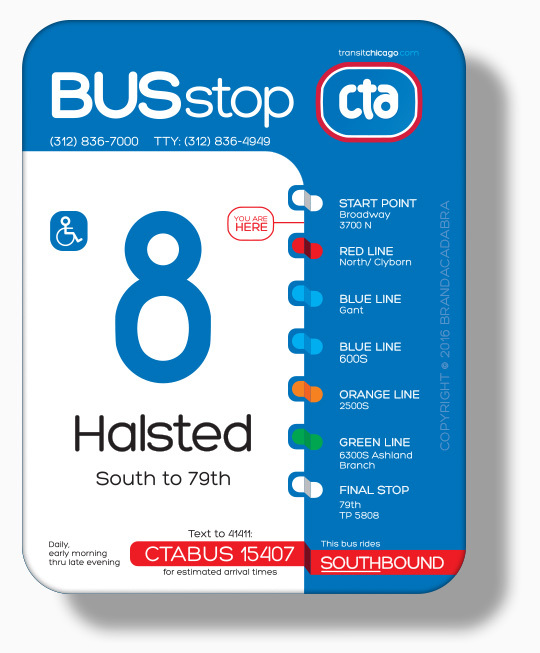 Also, “Clybourn” is spelled incorrectly and the Blue Line crosses Halsted at “Grand,” not “Gant.” For non-English speakers, the bus icon is useful and should be retained, although a more modern icon would be a good idea. “New Look” buses were retired almost 20 years ago, so the existing icon is hopelessly outdated. Also, retaining the compass (the arrow that points up to signify north) would be a good idea. Helps orientate the rider. Lastly, the sign you designed works for the southbound side of the street. Would you have 79th street at the top and Broadway at the bottom for the northbound side or would you keep the current orientation and print “final stop” at the top? FWIW, I am not a transportation engineer nor am I a CTA employee. PS: The “diagrams” are maps. They provide the rider with a picture of the route on which the bus travels. Prior to implementing map-based signs in the 1970’s, the signs had a text description of the route. Thank you. I would have loved a better mark, but I got even more out of you: feedback. If I look back now the most valuable thing derived from this exercise is the feedback (and of course the pleasure of doing something I love – in a very unperfect way). Thank you for your time in writing such a valuable comment.